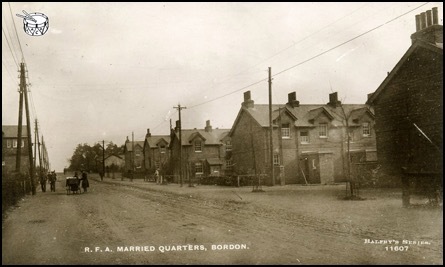 Reproduced below are postcards showing Royal Artillery married quarters in Bordon, Hampshire. 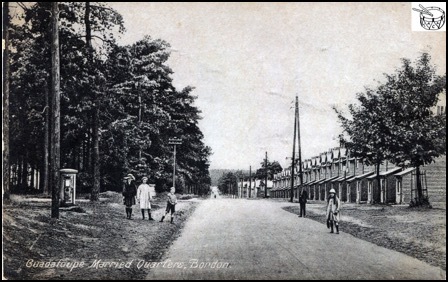 A British Army base since the start of the twentieth century, more images and information relating to Bordon can be found on the Hantsphere website. 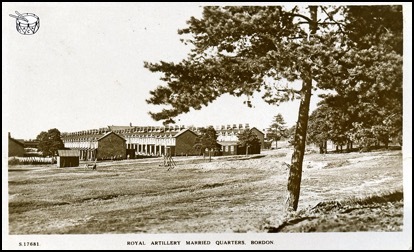 Below: A postcard captioned 'Royal Artillery Married Quarters, Bordon'. 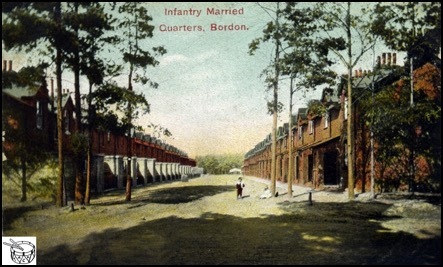 Below: The annotation tells us that the ranks of houses seen in the postcard below, which was sent in 1907, are married quarters attached to the infantry barracks in Bordon, Hampshire. Three army children, only just discernible (right), have been posed in front of the trees at the centre of the scene. 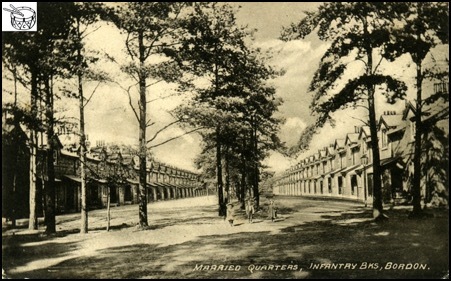 Below: Fewer trees are visible in this postcard, which bears the description ‘Infantry Married Quarters, Bordon’, so it may predate the black-and-white version above. A small boy, most likely an army child, can be seen at the centre of the scene (right). Below: This colour postcard was posted in February 1911 from Bordon Camp by an occupant of one of the married quarters shown in the photograph: an army wife and the mother of an army child (at the time the possessor of seven teeth, as his proud mother, Aline, reports). 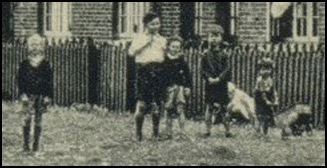 An older boy can be seen standing in front of the terraced houses (see the detail at right). Below: The black-and-white postcard below shows a road with army children ranged on either side of it (bottom) looking at the photographer. 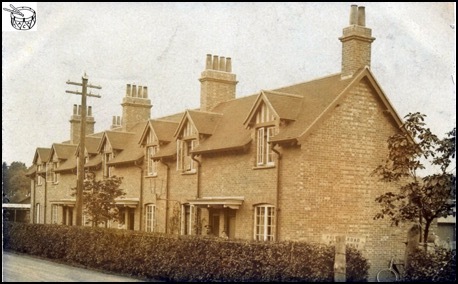 The caption informs us that the houses shown are some of the married quarters of Guadaloupe Barracks in Bordon, Hampshire. The printed details on the back include ‘10859 . . 1913’, which suggests that this photograph may date from 1913. 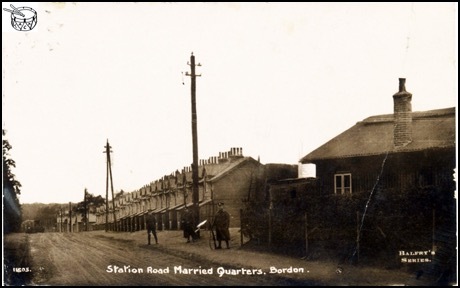 Below: As the text at the foot of the image below tells us, we are looking at ‘Married Quarters, Station Road, Bordon’, additional details being ‘Tribe Series’ and ‘No. 12097’. It is not clear when the photograph was taken, but it was printed on a postcard mount with a divided back, which means that it dates from 1902. There is a message written in pencil: ‘this is the Place were [sic] I am staying the 3rd Block on the left, no shops only Barracks and Feilds [sic] the last Place ever made’. 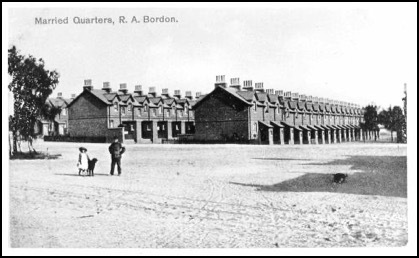 Construction started on Bordon Camp in 1899, and it was occupied by the army from 1903. Below: Three soldiers, one resting his rifle on the ground, can be seen in the postcard below, of Station Road, Bordon, Hampshire, which was posted in October 1915. The terraced row of married quarters behind them would have been home to numerous consecutive army families. 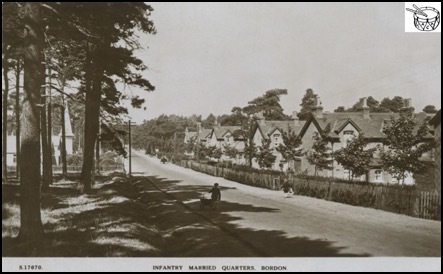 Below: The caption on the black-and-white postcard shown below, which was posted in 1930, reads ‘Infantry married quarters, Bordon’. 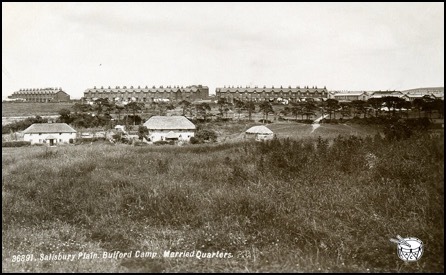 Although Bulford Camp was established at the end of the nineteenth century, it was not until the late 1930s that new brick houses began to replace the wooden huts that had served as married quarters until then. 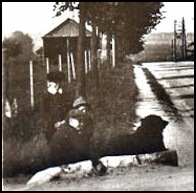 Below: Army children and their dog pictured opposite the 'C' lines married quarters at Bulford Camp. Left: Judging by the boys' caps and collars, these hutments would then have been between ten and twenty years old. 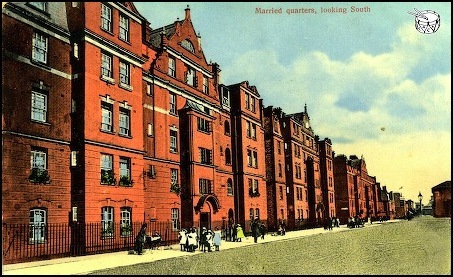 Below: The red-brick rows of terraced married quarters shown in the postcard below seem an improvement on the hutments in 'C' lines. Below: Captioned 'Salisbury Plain. 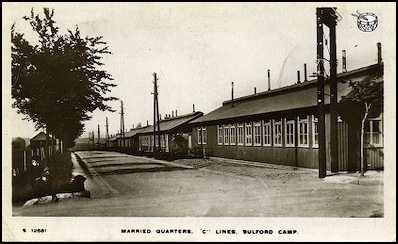 Bulford Camp. 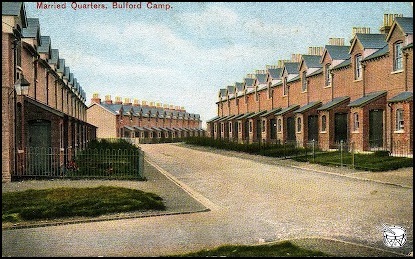 Married Quarters', this old black-and-white postcard (which dates from the first half of the twentieth century) offers a rather bleak view from Salisbury Plain of terraced married quarters at Bulford Camp. 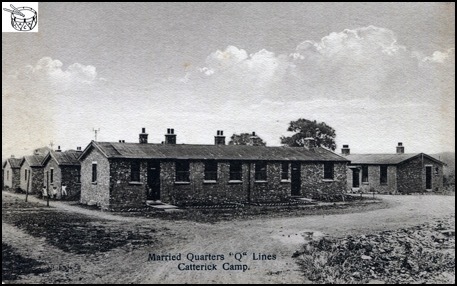 As the caption indicates, the postcard below shows the rather basic-looking married quarters that formed part of ‘Q’ Lines at Catterick Camp. Three army children can be seen to the left of the buildings (see also right). It is difficult to judge when this photograph was taken, but it most likely dates from the first half of the twentieth century. 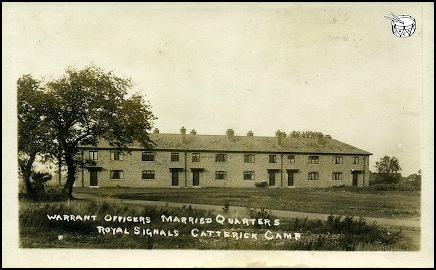 The Royal Corps of Signals was based at Catterick, in North Yorkshire, between 1925 and 1994, so plenty of children whose fathers served in the corps will have lived in the six married quarters pictured below, which were allocated to the families of its warrant officers. 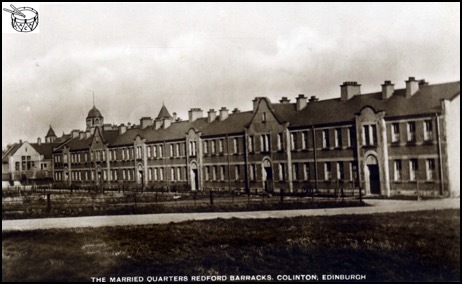 The caption on the front of this black-and-white postcard tells us that we are looking at ‘The married quarters, Redford Barracks, Colinton, Edinburgh’. The postcard is unused, and it is difficult to estimate the date of the photograph, which was published as a postcard (‘No. 3613’) by ‘Wm. Gardner, Stationer, Colinton’. (Redford Barracks itself dates from 1909.) According to a Historic Environment Scotland report, the married quarters were demolished during the 1990s. Flanked by rows of married quarters, children feature prominently in a postcard dating from 1906, reproduced below. 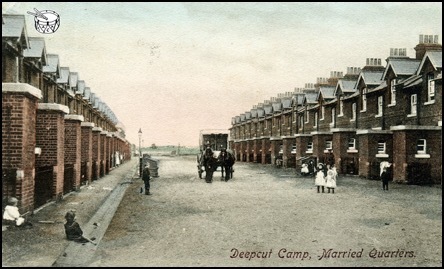 Labelled ‘Deepcut Camp, Married Quarters’, these houses in Deepcut, Surrey, would then have been only recently built for army families. 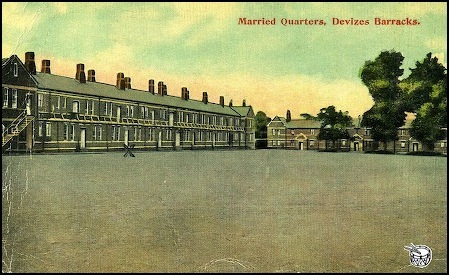 A tinted postcard dating from the World War I period of the married quarters at Devizes Barracks is shown below. 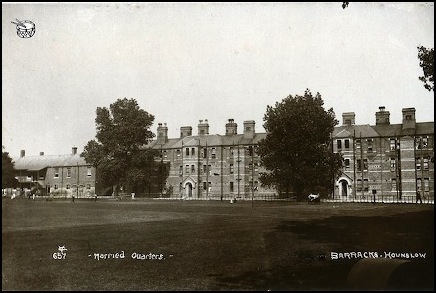 Construction of Devizes Barracks, or the Le Marchant Barracks, in Devizes, Wiltshire, was completed in 1878, and the barracks served as the Wiltshire Regiment's regimental headquarters until 1959. Look closely, and a woman wearing a long, white apron or gown can just be discerned standing at the top of the stairs leading to the first floor on the left. 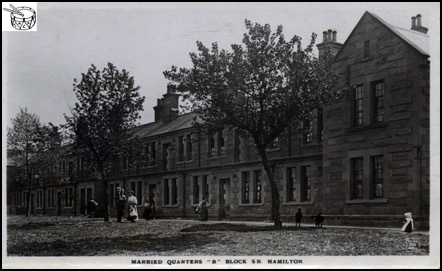 As its caption tells us, the black-and-white postcard below presents a view of the ‘MARRIED QUARTERS “B” BLOCK SR. HAMILTON’. Details printed on the reverse of the postcard state that it was produced by ‘Blair, Beckford Street, Hamilton’, which is in Lanarkshire, Scotland. A soldier, army wives and a number of army children can be seen in front of the stone terraced houses (bottom), and judging by one of the ladies’ hairstyle and clothes, this image dates from the early 1900s. From 1881, Hamilton Barracks served as the depot of the Cameronians (Scottish Rifles) and the Highland Light Infantry. 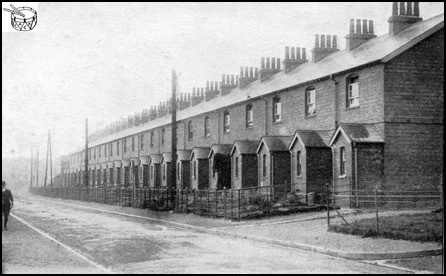 Pictured in the early twentieth century, the married quarters shown below in Hounslow, Middlesex, were located within the barrack boundaries. 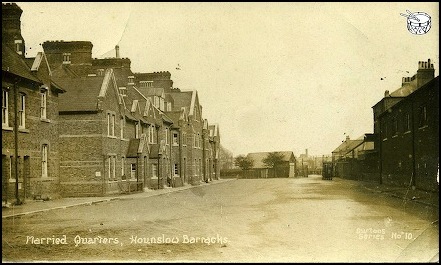 The sepia-toned postcard below, which dates from the first half of the twentieth century, gives another view of the married quarters at Hounslow Barracks. 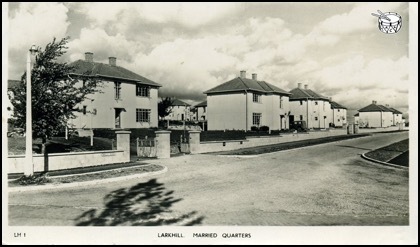 The black-and-white postcard below, whose postmark indicates that it was posted in 1956, presents a view of married quarters at Larkhill, Wiltshire. Larkhill Camp was established in 1899, and the Royal School of Artillery has been based there since 1919. 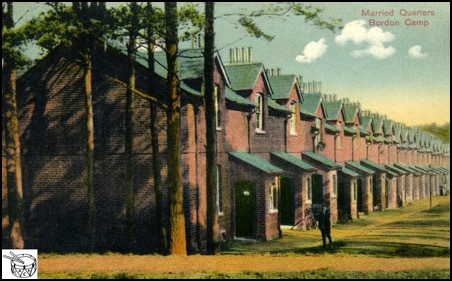 According to the handwritten note on the back, the postcard reproduced below shows a row of Royal Engineers’ married quarters at Longmoor Camp, Hampshire, probably around a century ago. The signature appears to say ‘Nance’, below which is written ‘at the door of quarters with baby’. They are difficult to make out, but there seem to be two possible candidates standing at the quarters’ front doors (see the detail below): one women with her soldier–husband on the far right, and another at the door behind the telegraph pole and tree. There was once a garrison at Lydd, in Kent, which is notable for having given its name to lyddite, a shell-firing explosive that was first tested there during the 1880s, when Lydd was an artillery practice camp. 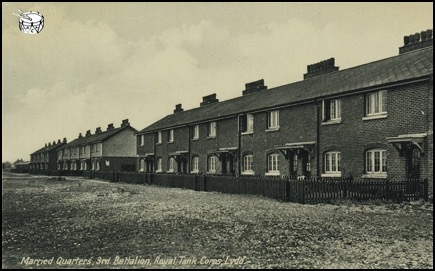 The pair of black-and-white postcards pictured above and below, which show remarkably similar views, are both labelled ‘Married quarters, 3rd Battalion, Royal Tank Corps, Lydd’. There are a few additional details to be discerned in the postcard below, however: an identifying sign spelling out ‘C Block’ attached to the wall of the quarter on the far right, and a group of army children captured playing on the common ground in front of the quarters (see the detail at the bottom). 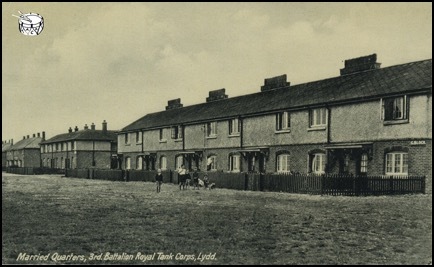 Lydd was the headquarters of the 3rd Battalion, Royal Tank Corps from 1923 to 1939, the period from which these postcards date. 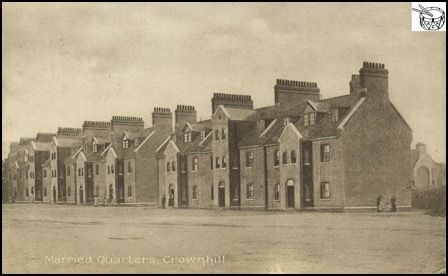 Posted in 1915, the sepia-toned postcard below shows the married quarters within Crownhill (or Crown Hill) Barracks, in Plymouth, Devon. They were constructed in 1898. 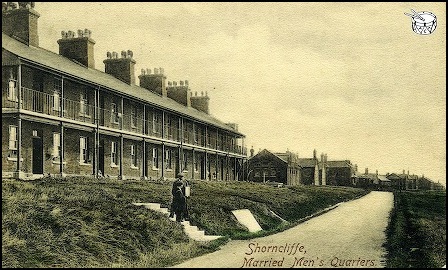 'Shorncliffe, Married Men's Quarters' is the caption printed on the postcard reproduced below, whose postmark reveals that it was sent in May 1907. There has been a military presence at Shorncliffe, near Folkestone, in Kent, since the late eighteenth century, when it was feared that Napoleon's army would invade England. 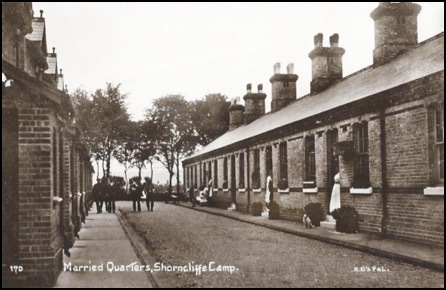 As the caption states, the postcard below presents a view of ‘Married Quarters, Shorncliffe Camp’, in Kent. Judging by the style of clothes worn by the women standing in the doorways on the right, the postcard dates from the early years of the twentieth century. Also discernible are a pet dog and a group of men – some in uniform, some in mufti – walking up the road. 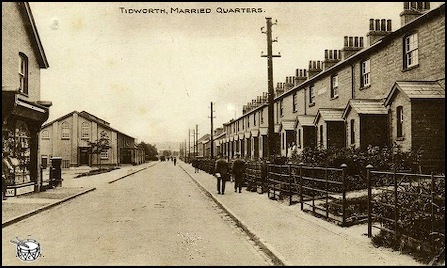 Above and below: A postcard (above) showing married quarters at Tidworth, Wiltshire, around a century ago. 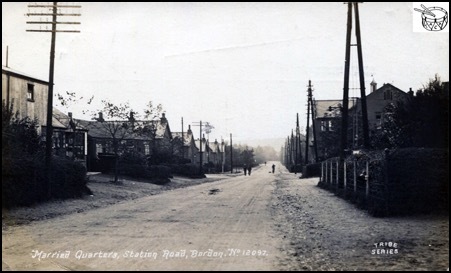 This postcard (below) shows the opposite end of the street. 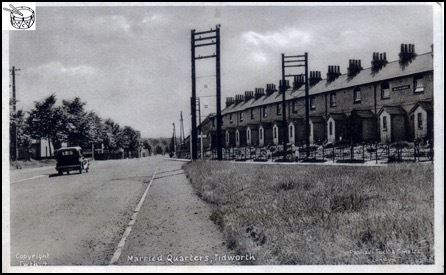 Below: This postcard is captioned 'Tidworth: married quarters'. 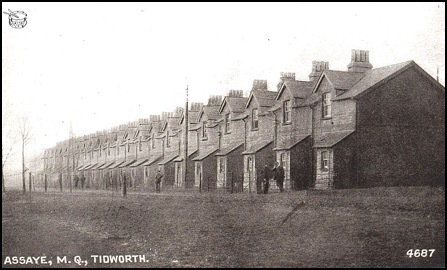 These terraced homes in Tidworth were nicknamed 'Merthyr Tydfils' on account of their similarity to the housing provided for miners and their families in Merthyr Tydfil, then a significant colliery town in south-east Wales. 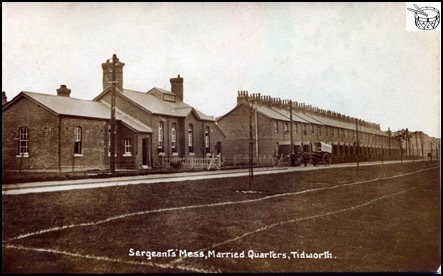 Below: The postcard on which this sepia-toned photograph of a row of married quarters alongside the sergeants’ mess at Tidworth, in Wiltshire, was printed bears no indication of its date. 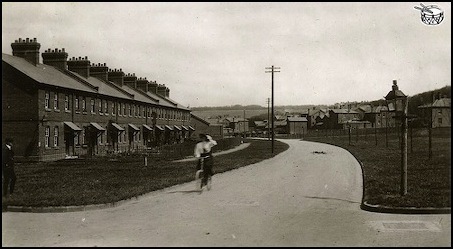 That said, the horse and cart visible in the road suggest that the photograph was taken some time in the early twentieth century. 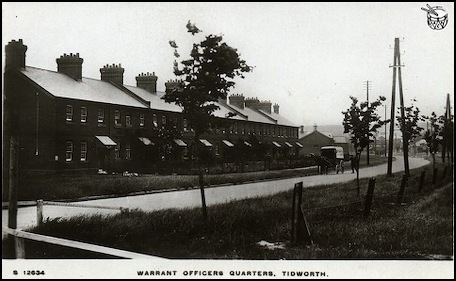 Above and below: Three postcards labelled 'Warrant officers quarters, Tidworth'. 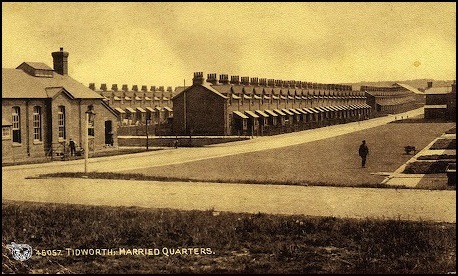 Below: This postcard shows a row of terraced married quarters at Assaye Barracks, Tidworth. 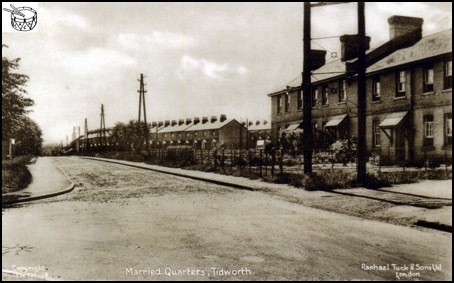 Below: This black-and-white postcard showing some of the married quarters at Tidworth was produced by Raphael Tuck & Sons, of London, first being printed in 1937. 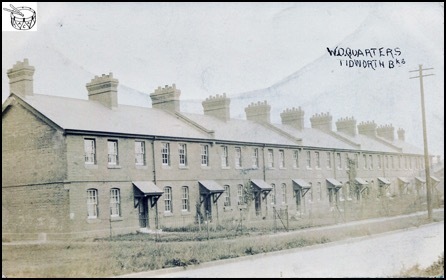 Below: A note on the back of this black-and-white postcard says that the pictured houses are married quarters in Candahar Barracks, Tidworth, in 1918 to 1919. 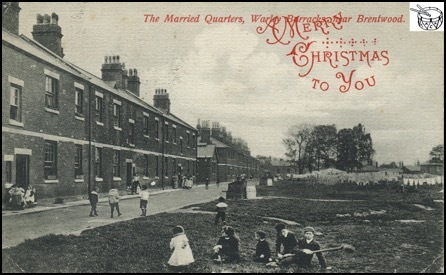 ‘Merry Christmas to you’ is the message printed over the caption identifying the location shown on an old black-and-white postcard as ‘The Married Quarters, Warley Barracks, near Brentwood’, in Essex. The card was posted in 1910, which corresponds to the style of dress worn by the army children seen in the foreground. (Behind the children on the right can be seen communal washing lines filled with drying laundry.) At this time, Warley Barracks was the depot of the Essex Regiment. 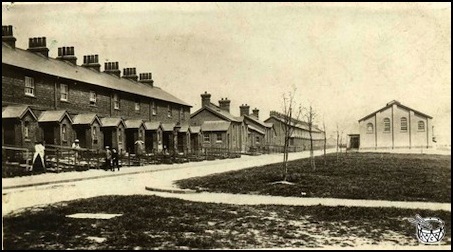 The postcard pictured below shows married quarters in Woolwich, south-east London, 'looking South', and dates from around the time of World War I. Building work began on the Royal Artillery Barracks in Woolwich in 1782.